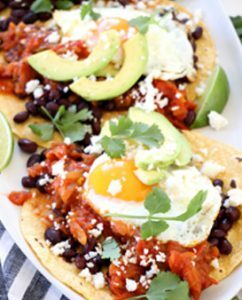 Huevos rancheros is a traditional Mexican breakfast dish that consists of eggs, beans, tortillas, and a tomato chili-based sauce. This recipe replaces the sauce with jam made from Divine Flavor grape tomatoes! In a large, heavy bottomed pot or cast iron skillet, heat olive oil over medium high heat. Add tomatoes, sliced jalapeno, sliced onion, and cook until the tomatoes begin to blister, about 4 minutes. Transfer tomatoes, jalapenos, and onions to a food processor or blender. Add remaining ingredients and pulse until chunky smooth. Add back to the pan and cook on a simmer for 20 minutes until thickened. 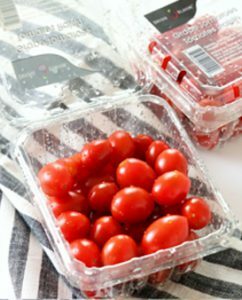 Serve or store in an airtight container for up to two weeks. Heat olive oil in a medium-sized pan over medium heat. Add black beans and lime juice, and cook over medium heat until the beans are warmed through, about 4 minutes. Season with salt and pepper. Keep warm but set aside. In a nonstick pan, drizzle in a teaspoon of olive oil, just enough to grease the pan. Warm tortillas over medium heat for 30 seconds and remove to a serving dish, layering two together per serving. Cook eggs sunny side up in the same pan with a drizzle of olive oil, about 3 minutes. To assemble, stack the tortillas, two per serving, and top with black beans, tomato jam, cooked eggs, and garnish with sliced avocado, cilantro, and crumbled queso fresco.